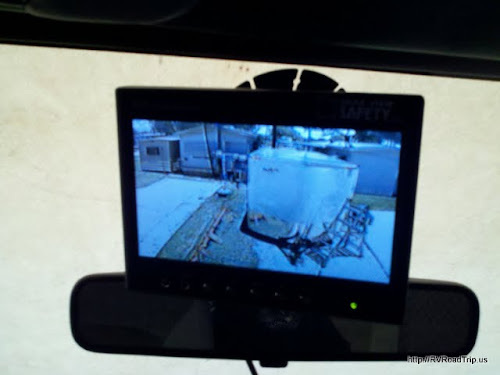 BUY THIS BACKUP CAMERA HERE! 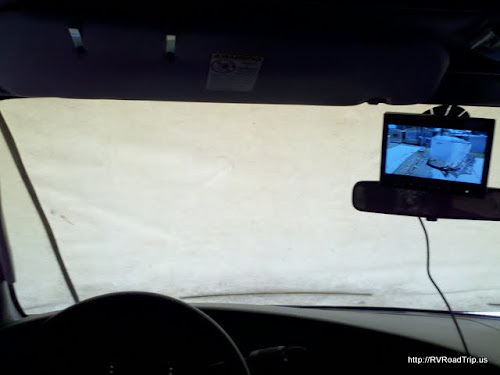 When we bought our Class C motorhome, it did not come with a rear view camera. Oddly enough, it did come with a rear view mirror. I guess that would be useful if you had kids to keep an eye on while driving, but for us it is useless. So we started doing our research to find a good quality wired rear view camera. The search took a week as we had to weed through all the Chinese made crap that is out there. You get one 130° wide angle Color CCD infra-red weather proof backup camera, one 7" TFT LCD color rear view monitor with universal mount/stand and wire, one 3 channel multiplexer control unit, one 66â€™ extension cable for camera, one Wireless Remote control, one Power connection wire, one Double RCA + power converter, (to connect external, audio video and power), and one screw kit for installation. 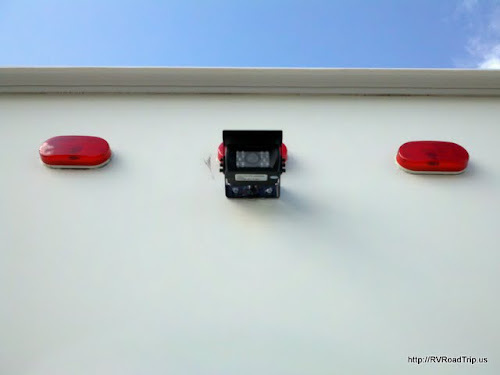 Before you begin the installation, hook the unit up to make sure everything works. You don't want to get it all installed only to find out you have a problem somewhere. You will need the following to be able to properly complete the installation: a drill, a 3/4" bit, a cross-tip screwdriver, some ProFlex RV sealant, some patience and about 2 hours. We also used wire ties and some wire loom to secure the wire under the RV. 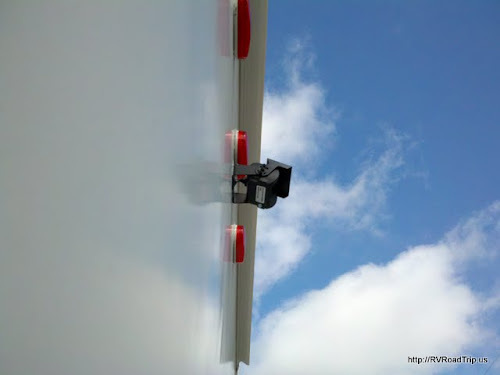 We looked online and saw that every rear view camera on a motorhome was mounted below the clearance lights, so this is how we mounted ours. Our clearance lights are kinda low but 6" didn't make that big of a difference. Using a pencil, we marked where we would drill the 3/4" hole for the wire to feed through. We made sure there wasn't a wall stud in the way and after starting the hole, we looked to make sure there weren't any existing wires in the way. With an all clear, we drilled a hole through the wall. Because of where we had to mount the camera, we decided not route the wire through the ceiling rafters. It would have been a tremendous undertaking to try to fish 66' of wire through the rafters so we opted to go through the floor and under the RV. Our hole punched through inside the kitchen cabinet. I didn't empty the cabinet beforehand and the drill bit tore a whole into a packet of white gravy mix. I taped it up so we can enjoy that gravy one morning with our biscuits! I then drilled another 3/4" hole into a nearby wall that is hollow and this is the route we took to the floor. Yet another 3/4" hole was drilled and now the wire is outside. We fished it all through then sealed it all up with ProFlex RV sealant. We removed the rubber grommet that came on the camera as we couldn't get it to fit. We aligned the camera, tested the angle and screwed that sucker in place. A generous helping of sealant will keep any moisture outside where it belongs. Yes, we cleaned off that smudge in the first picture. You weren't supposed to notice that! Now the fun part, routing the wire under the motorhome. We won't go into detail as your routing will be different than ours, just make sure to avoid heat sources and potential pinch points. Once we had the wire in the cab, we coiled up the excess and tucked it and the multiplexer under the dash. We mounted the monitor above the silly rear view mirror. We connected the power wires to a male cigarette lighter plug so we can easily remove power from the unit when parked. If you only want yours to come on when you are in reverse, connect the blue wire to your backup light circuit. We twisted the red and blue wires together so ours is on anytime we plug it into the cigarette lighter.